$8 general admission. Thursday/Sunday performances are ASL interpreted. Before podcasts came radio plays which were insanely popular during the 1940s. 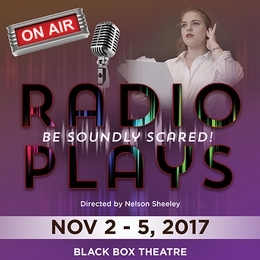 We’ve selected four examples of plays focused on sound from the horror genre: Personal Call by Agatha Christie, The Wall by Sinclair Alumnus Travis Williams, Earwigs by Joseph Zettelmaier and Frog Eaters by Sinclair Student Maximillian Santucci. Thurs., Nov. 2 - 7 p.m.
Fri., Nov. 3 – noon & 8 p.m. Sat., Nov. 4 – 8 p.m. Sun., Nov. 5 – 2 p.m.
For general information about the Sinclair Theatre season, visit www.sinclair.edu/tickets.